So my dad has been on a roll lately. This time he picks up a big Australian Salmon! With the weather cooling, there are not much baitfish around and he was only able to catch the two. He put one on and as he was able to put the other on, the rod took off! 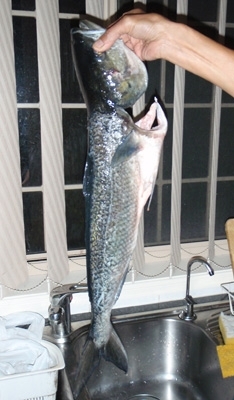 After a long fight, for what looked like a big mullet as we saw colour, turned out to be a big Australian Salmon! It measured 70cm. Salmon have a habit of jumping out of the water, so we did not expect it to be a salmon while winding it up. It weighed about 3-4kg and our collapsible net barely held it in. We’ll definitely be looking for a new net this weekend!